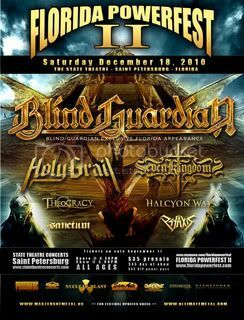 BLIND GUARDIAN have been confirmed to headline Florida Powerfest II, taking place at the State Theatre in Saint Petersburg, Florida on December 18th. Acts confirmed for the festival include: BLIND GUARDIAN, HOLY GRAIL, SEVEN KINGDOMS, THEOCRACY, PSYAXIS, HALCYON WAY and SANCTUM. Tickets go on sale September 17th via Ticketmaster. Presale tickets are $35, Day of $45, and VIP $65. VIP tickets and details will be available exclusively through Seven Kingdoms homepage. Further festival details at this location.